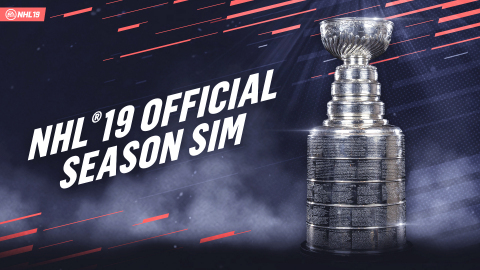 REDWOOD CITY, Calif.--(BUSINESS WIRE)-- With the 2018-19 NHL® season set to start next week, EA SPORTS™ NHL® 19today released the results of its annual season simulation. In what has become an annual tradition, the EA SPORTS NHL simulation predicts who makes the Stanley Cup Playoffs, who takes home the major awards and which team will hoist the Stanley Cup®, ahead of each season start. Big off-season acquisitions played a large role in the NHL® 19 simulation this year. Led by star center John Tavares, this year’s predicted Conn Smythe Trophy winner, the high-octane Maple Leafs dominate the Eastern Conference before defeating the San Jose Sharks in the 2019 Stanley Cup Final, ending a 50-year championship drought for the Original Six franchise. A link to the NHL® 19 blog post detailing all the results can be found here. NHL ® 19 launched to critical acclaim on September 14, heralded as “the best playing hockey game of the generation” by Game Informer and “the best sports game currently on the market” by Inside Hockey. NHL® 19 introduces players to the World of CHEL where they can compete in the great outdoors and journey from the pond to the pros. Powered by the revolutionary RPM Tech gameplay technology, NHL® 19 delivers all-new skating and collision physics systems that make gameplay look, feel and play better. In addition, over 200 playable hockey Legends gives fans the chance to compete with and against the greatest players to ever lace up their skates. The EA SPORTS NHL season simulation is conducted annually by artificial intelligence that uses real-life data from each player. Results are determined by the videogame when two teams match up based on player ratings, line combinations, and include variances such as injuries and hot streaks to give a realistic outcome of a game or series. NHL, the NHL Shield and the word mark and image of the Stanley Cup are registered trademarks and Original Six is a trademark of the National Hockey League. NHL and NHL team marks are the property of the NHL and its teams. © NHL 2018. All Rights Reserved.